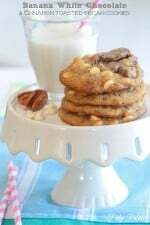 My Banana White Chocolate and Cinnamon Toasted Pecan Cookies are a banana bread and pecan party in your mouth. I created one amazing cookie for you today. These cookies taste like a gooey, sweet little banana bread slice with crunchy cinnamon toasted pecans throughout. These are right up there with some of my favorite cookies. The flavor combination is so fun! 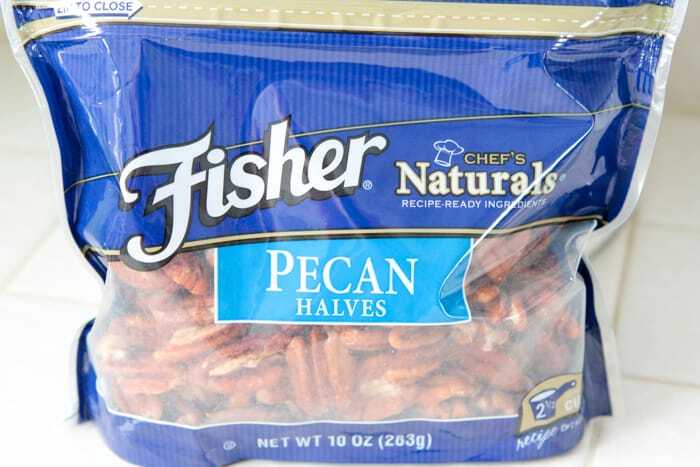 Here is the big bag of Fisher Pecan halves that I used. 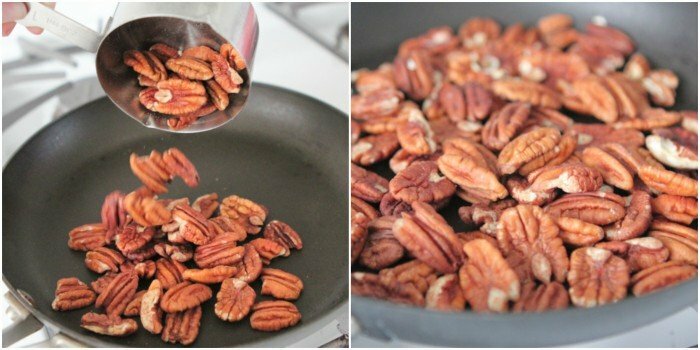 After I made these Cinnamon Toasted Pecans on the stovetop, I had to fight my husband away before he ate them. The pecans are addicting and make such a great gift for the Holidays on their own. If you’re one to venture into the contesting world–one world in which I used to compete in often, and in fact was a precursor to Picky Palate–Fisher and Chef Alex Guarnaschelli want to feature your homemade recipe! 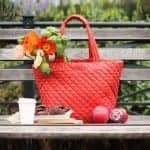 Be sure to Enter the My Fresh Twist Recipe Contest by submitting a recipe and picture of your signature dish prepared with pecans, walnuts, almonds and/or peanuts for your chance to win a trip to New York City and meet Chef Alex Guarnaschelli. Click HERE for all of the details. Now, let’s move on to the steps. 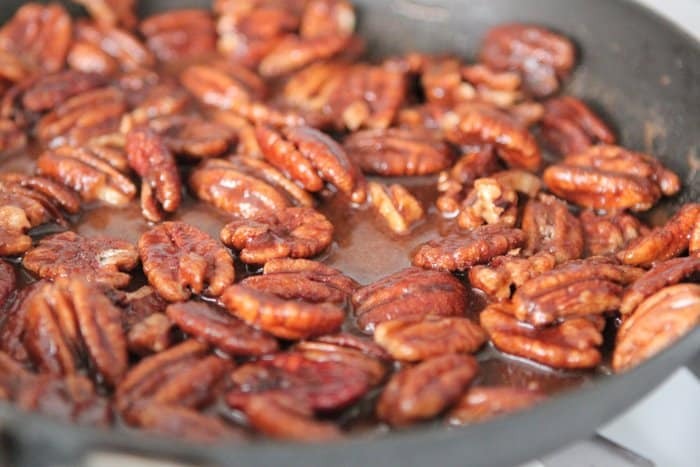 To prepare your cinnamon toasted pecans, start by pouring your pecans in a hot skillet over medium heat. Pour in your sugar and cinnamon. Add a couple tablespoons of water. 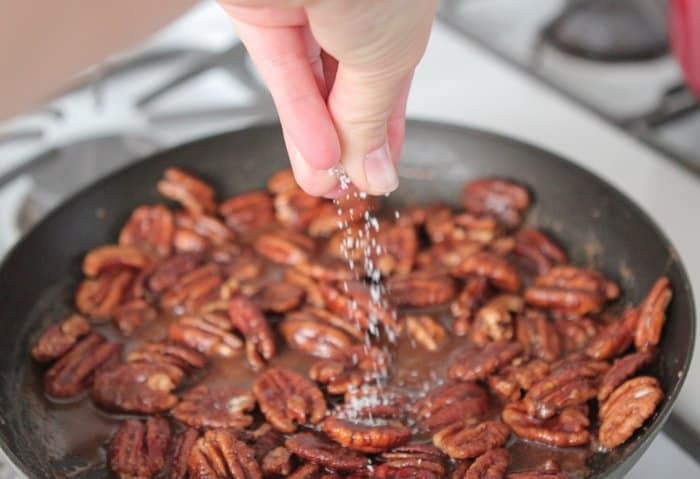 Stir to coat all pecans. Add a touch of salt. Let the pecans bubble and boil for a good 5 minutes until they become thick and coated. Ta da! Transfer to some parchment paper so they can cool completely. Time to make the cookie dough. Start by creaming your butter and sugars then add your egg, vanilla and 2 very ripe bananas. 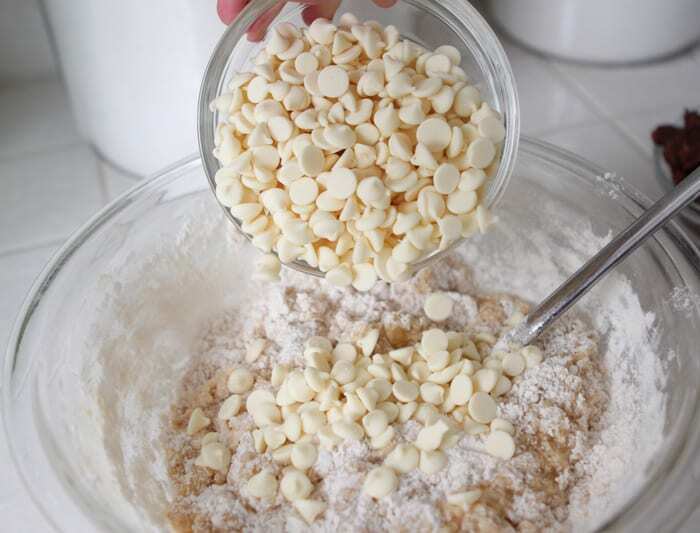 Add your lovely white chocolate chips. Semi-sweet chocolate chips would work great too. 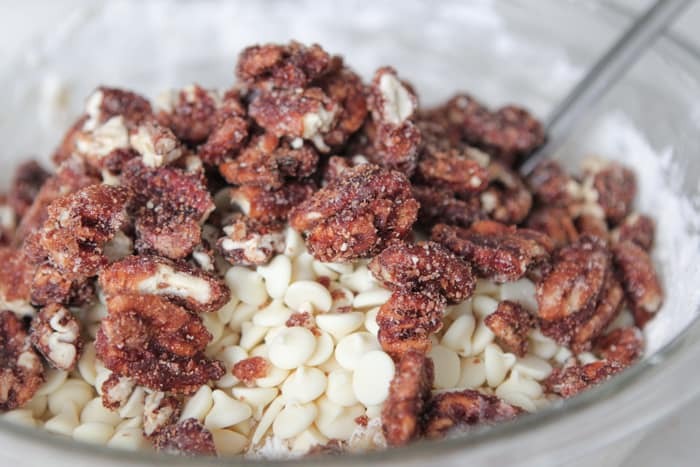 Slightly crush your pecans and add them to the bowl. Just you wait until you smell these babies baking in the oven. Your house smells like a dream. Enjoy! 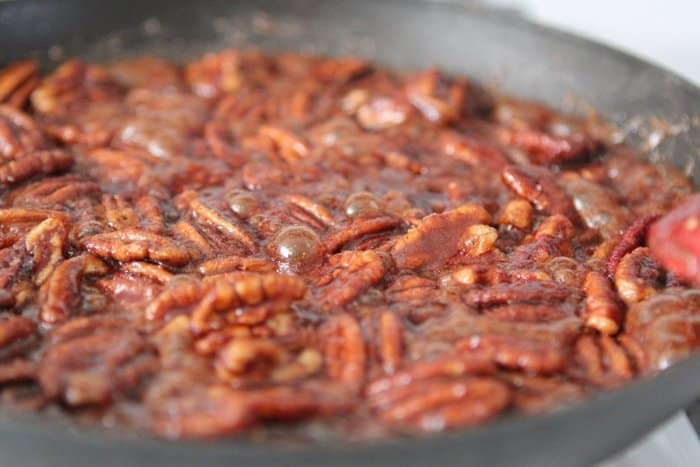 Place Fisher Pecan Halves into a medium non stick skillet over medium heat. Stir in sugar, cinnamon and water until combined. 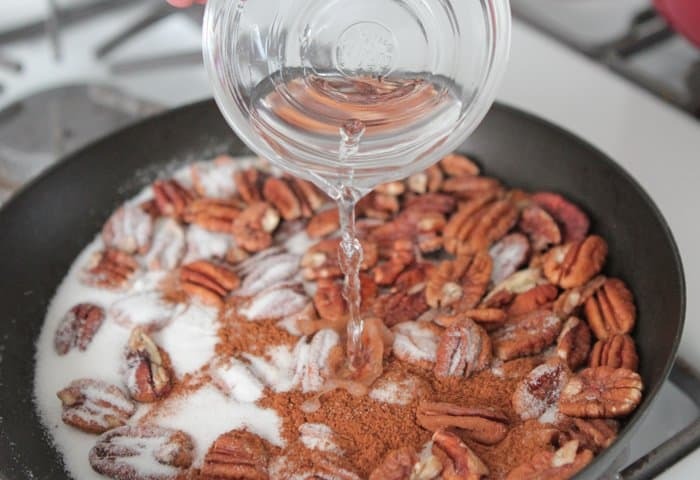 Stir and let pecans bubble cook for about 5 minutes. Mixture will become thick. 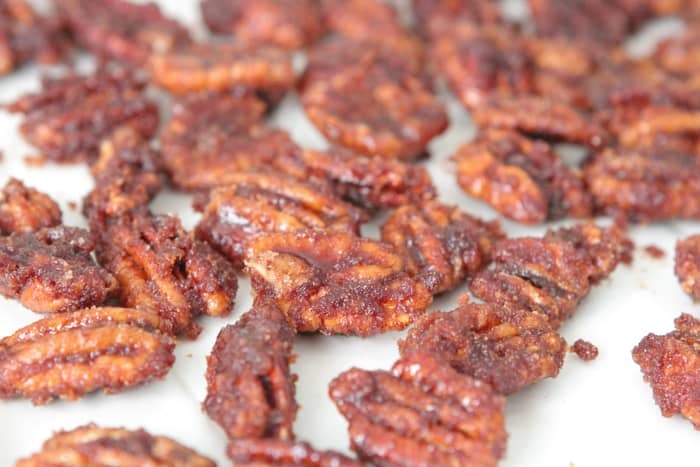 Pour pecans onto parchment paper to cool for at least 15 minutes before adding to cookie dough. 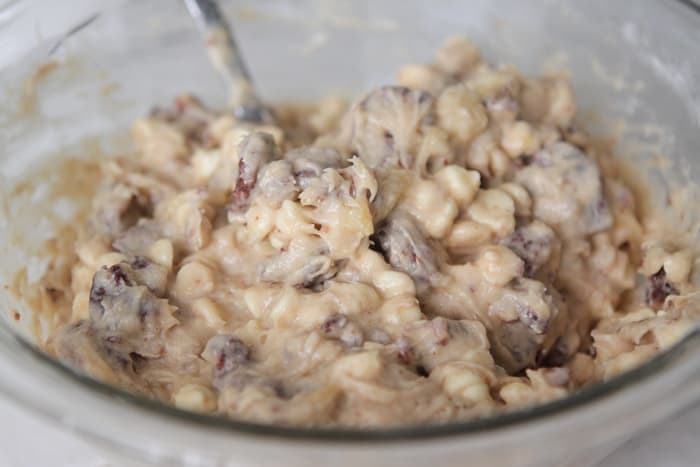 To prepare cookie dough, cream butter and sugars into a large mixing bowl. Add egg and vanilla mixing to combine. Mash bananas and add them to the bowl, stirring. Add flour, baking soda, salt and white chocolate chips stirring. 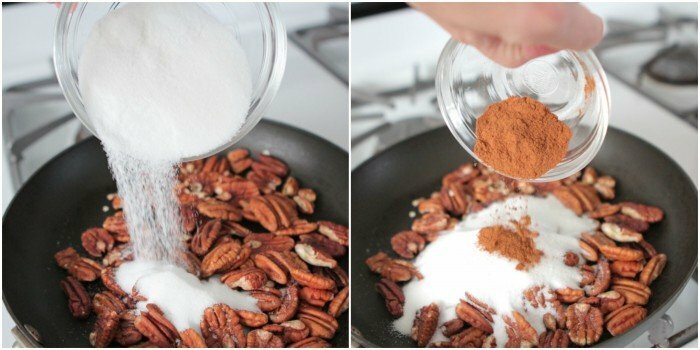 Place cinnamon toasted pecans into a large ziploc and crush slightly. I still kept mostly large pieces. Add to bowl and mix to combine. With a medium cookie scoop, place dough onto a large baking sheet lined with a silpat liner or parchment paper. Leave a good inch and a half between each cookie. Bake at 350 degrees for 15-16 minutes until golden brown. You want these too bake longer than you typically bake cookies. Let cool on baking sheet for 15 minutes before transferring to cooling rack. This is a sponsored post for Fisher Nuts, however thoughts and opinions are my own. 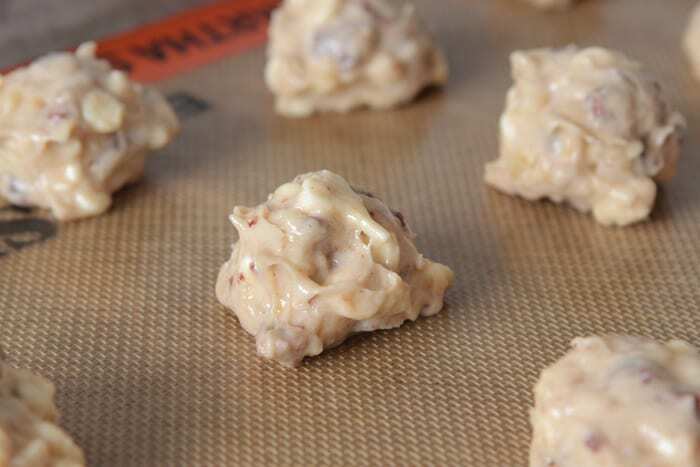 These are going to be my boyfriend’s new favourite thing – he goes crazy for pecans and white chocolate! 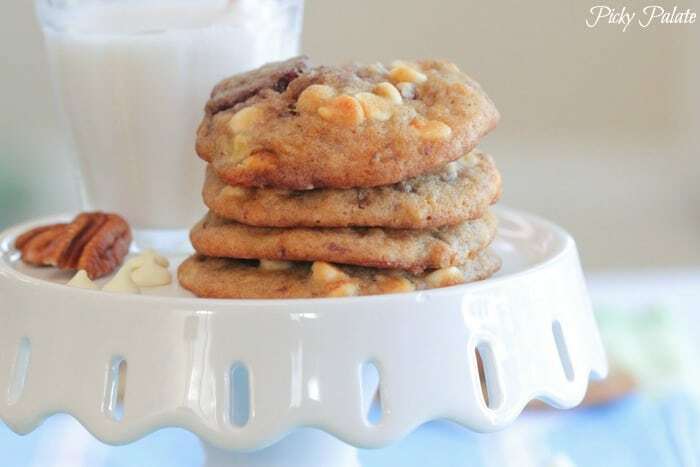 So excited for all the upcoming nutty recipes! Especially with the holidays coming up! I love nuts during the holidays! These cookie look amazing, as always! YUM! Loving the flavors in these cookies! Pecans and bananas go so well together. These look so delicious! I love pecans and white chocolate! These look so good! I could see this being put out for holiday dinner parties! Those cookies sound AWESOME, Jenny! Banana bread COOKIES?? Love this idea — cookies for breakfast!!! Oh yeah! I LOVE that you put banana in these!! Anything with pecans & i’m totally sold!! I can’t wait for my house to smell like a dream! These look delicious! Yum! Love the toasted pecans!! Love it girl! Can’t wait to make these! Such a great combination of flavors! I can’t wait to make these. I love pecans, cinnamon & cookies! Can’t wait to try these!!! What great flavors to pack into a cookie!! These sound awesome! 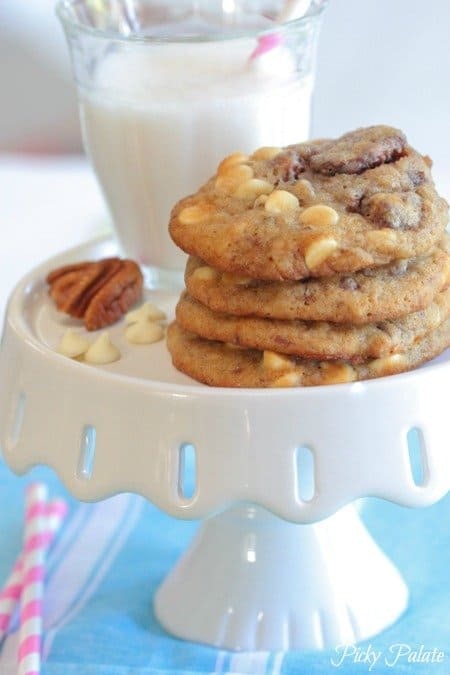 I don’t know if those cinnamon toasted pecans would even make it to the cookie batter they look so tasty! Can’t wait to try! What temperature should this cookies be set at? You have the bake time, but not the temp! Thanks and have a great day! 350 degrees Crystal,I’ll go edit that. These look divine! I love banana and the candied nuts send them over the edge! These look gorgeous! Can’t wait to try! These sound so good with the candied pecans! Made these the other night in the “semi-homemade” format due to time using a sugar cookie mix. They came out great! The banana helps keep them so moist! Will be a definite addition to the holiday cookies! These cookies are a party for your taste buds!!!!!!! They are so good. I am definitely going to make this one again. Thanks for the great recipe. these cookies are amazing. i grated in some fresh ginger for one tray, to see how it worked, and i highly recommend. I’m not a huge fan of white chocolate. 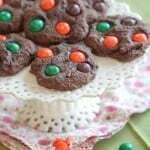 Do you think dark chocolate chips, milk chocolate chips, or semisweet chips would taste good in these cookies instead?